Images have the power to bring narrative to life, and in the process render a story into a sensory experience felt by a reader. For the victims of the Armenian genocide of 1915, their story is one that has been resigned from view and overlooked by generations. 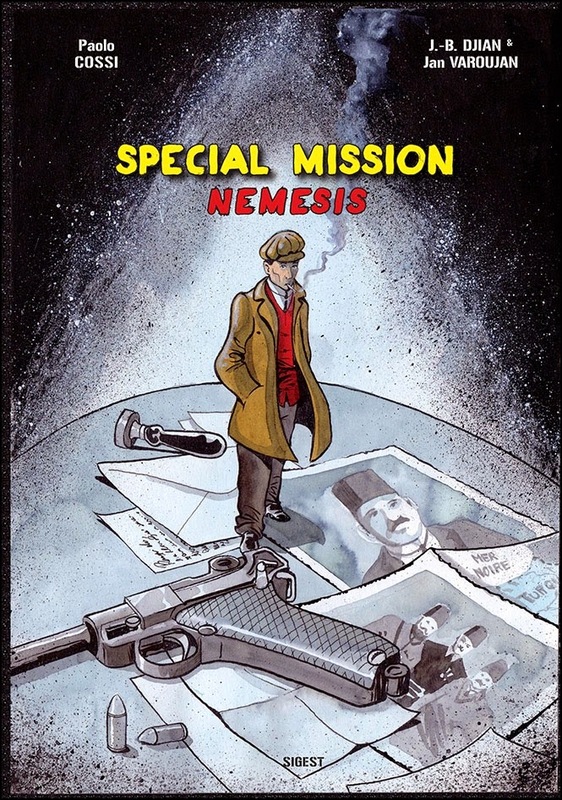 In the graphic novel Special Mission Nemesis, the authors and illustrators combat the anonymity that clouds the Armenian genocide by bringing it to life through the dialectic of text and image. Through the lens of a 1921 trial in Berlin of accused Armenian assassin Soghomon Tehlirian in the death of Turkish Grand Vizier Talaat Pasha, the Armenian genocide is brought to life through Soghomon’s experiences as a civilian victim. Through the visual use of framing and shading Soghomon’s flashbacks create a visual and emotional tension between past and present, allowing the reader to experience the personal element of genocide. 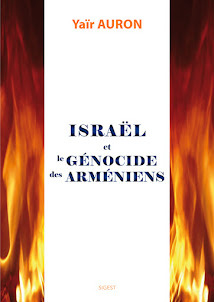 In order for the reader to empathize with Soghomon’s testimony, the Armenian genocide is first presented in a context of factual and historical standing. On page 11, panel 1, Soghomon is presented with his back to the viewer in a medium over the shoulder shot, signaling the viewer’s alignment with Soghomon and inviting the viewer to join in participating in the personal account of his experience. The viewer is made to feel as a third party objective witness to the courts’ procedure in establishing Soghomon’s testimony as historical fact. Despite his lowered position as an accused murderer, Soghomon dominates the right visual field of the panel, suggesting his importance and adding weight to account of what occurred during the massacre. In this panel shading and composition are crucial in setting the tone of Soghomon’s ambivalence in retelling this history and in connecting the successive panels of his memories to the tension of the genocide as historical fact and a subjective experience. On this page the color white appears most in the first panel, encompassing the judge in a repetitive circle motif seen throughout the graphic novel. 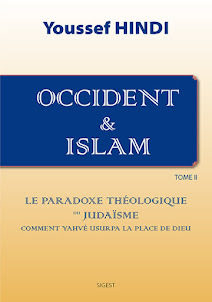 This white circle has a spotlight effect, suggesting the metaphoric presence of a rational justice system seeking to “shine” a light on the actual history of the Armenian genocide. In contrast, Soghomon’s black hair brings the eye back to Soghomon, revealing a shadow on the back of his neck, perhaps an allusion to the looming story that haunts his memories, as is revealed in the following panels. As Soghomon begins his testimony of the genocide, the device of flashback reinforces the tension of Soghomon’s trauma as a resurfacing memory. Departing from the courtroom in panel 1, Soghomon begins to relate his memories, which by panel 3 signals his fragility as he relives the emotional pain of witnessing the deaths of loved ones each time he delves into the past. Soghomon is featured on the right side of the frame, in reverse of his position in panel 1, drawing attention to both his face and to the violent scene of his past. His memories are literally behind him, but they remain in focus creating a visual uncertainty for what the viewer should focus on, the violent flashback or Soghomon’s reaction. The visual close up of Soghomon in his court suit with downcast eyes in partial shadow against the background of his memory intensifies the temporal tension between past and present as his reality slips into the inescapable trauma of the past. The loosely sketched barren dessert background and obscure figural bodies contrasted with thicker and more expressive lines of Soghomon allow the reader to acknowledge the deaths witnessed by Soghomon, but continually return to his suffering face. Soghomon’s flashback bridges the factual and emotional aspects of living through the Armenian genocide to offer the viewer a well rounded and more complete image of a historical event. This panel is not just a transcript of what Soghomon said, but also a real memory of a genocide that deserves to be told. The viewer is invited into this memory and in doing so creates a memory of a history that the viewer never lived, but now can empathize with. By visualizing Soghomon’s past the viewer melds into his memories, fully experiencing the genocide as if it were happening. In panel 8 the composition of Soghomon on the right of the frame in a close up shot remains the same as the precedent set by the first panel and continued by the third panel, but now the viewer is completely melded into his memories. As the intensity of the flashbacks increase, all ties to the courtroom and the present disappear and by panel 8 Soghomon is literally encompassed by his memory. Soghomon is physically and emotionally ravaged by the massacre that he is experiencing and witnessing, pulling the viewer into the scene to experience it with him. 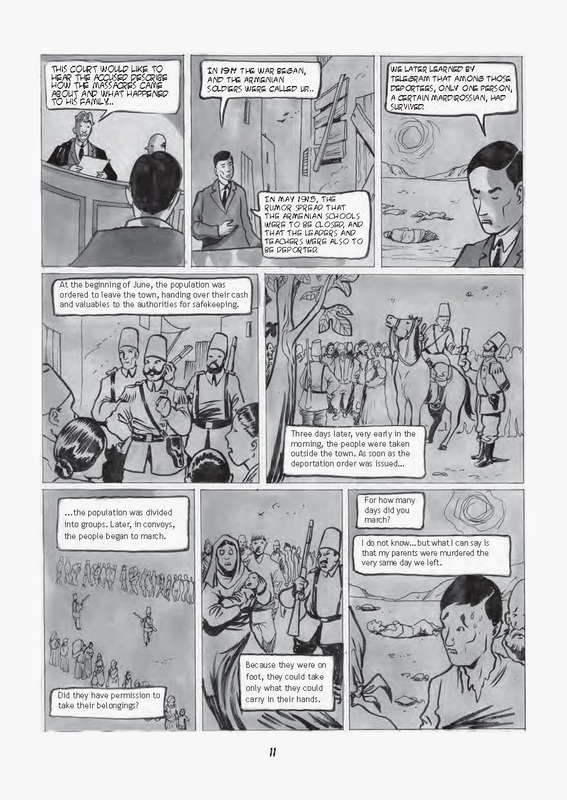 The replacement of the speech bubble with the text box further separates Soghomon from the present along with the transition from partial white highlight in panel 3 to a complete gray scale scene, designating this panel almost as a historical document, a snapshot of the emotional history of the Armenian genocide. The composition of panel 8 is nearly identical to panels 1 and 3, connecting the panels as a timeline of historical and emotional documentation. As a document accessible only to the viewer, these three panels illustrate the magnitude of what happened in the Armenian genocide to the viewer and allow the viewer to join in Soghomon’s memories. These panels make the personal element of genocide come to life as an event that affected real people and in order to empathize with the Soghomon’s acquittal the viewer is made to understand the factual and emotional aspects of genocide. In the graphic novel Special Mission Nemesis the emotional experience of Soghomon’s trauma is illustrated in an emotionally charged way to connect to the reader. The Armenian genocide is a reoccurring trauma for Soghomon, and the murder of Talaat Pasha is a direct response to his suffering. By utilizing a subtle visual language of framing, shading and composition, the experience of genocide is communicated to the reader and experienced in order to ensure the reader’s sympathies towards the juries’ acquittal of Soghomon. Soghomon’s flashbacks are a crucial narrative means to convey the Armenian genocide and foster an emotional connection to Soghomon’s past as well as the past of a lost population. 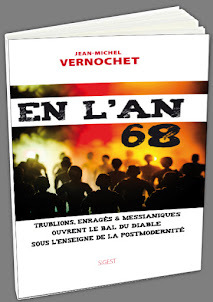 The visual component of Special Mission Nemesis gives the reader access into an inaccessible and violent history, and in the process the factual reality of the genocide is made real for the reader, allowing a meaningful understanding of Operation Nemesis to occur and Soghomon to transform from assassin to national hero.